Oceanfront pool treats you to killer views. Massive sun deck is perfect for serious sun-worshippers. Recruit some table-setters while you put the finishing touches on dinner. It's just big enough to offer all the right amenities. Kids will love the water park and other fun activities. Ocean Walk Shoppes offers a variety of dining options. The beachfront Daytona Beach Regency by Diamond Resorts is just steps from the Daytona Beach Boardwalk and has 24-hour security providing your family with peace of mind. Once you get settled into your condo, get changed into swimsuits, grab dive sticks and goggles and slather everyone head to toe in sunscreen. The outdoor heated pool with waterslide is sure to be a big hit with kids and grownups alike. (The indoor pool will come in handy if it rains.) Enjoy a refreshing cocktail from the poolside tiki bar or hit the beach, only steps from the pool. Hungry? Have a family cookout on the BBQ grills and let the kids assist with carrying burgers, hot dogs and side dishes. After lunch, drop the kids off in the arcade-style game room and get your cardio on at the fitness center. Studio condos sleep two guests. Kitchenettes with a mini fridge, microwave and two-burner stove allow you to prepare the basics. One- to two-bedroom condos sleep four to six guests and have full kitchens. Stock up on groceries at Publix Supermarket, less than three miles from the resort. Let the kids get creative and make their own pizzas for lunch. Declare the pizza with the most unusual toppings the winner and the pizza artist official movie-chooser. Once they’ve chosen from the selection of movies that you brought from home, pop some popcorn and call everyone else into the living room for family movie night thanks to the Flatscreen TV with cable and DVD player. Did the kids end up with pizza sauce on their clothes? No problem, the resort has an on-site laundry facility. 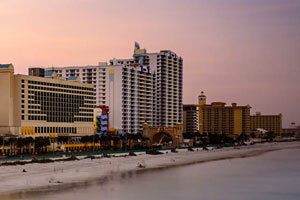 Daytona Beach Regency by Diamond Resorts is just steps to the Daytona Beach Boardwalk. It opened in 1938 and features rides, amusements, gift shops, two arcades and snack bars. The resort is a short walk to Ocean Walk Shoppes & Movies. Head to Maui Nix for apparel, swimwear and surfboards. Get a custom t-shirt at Point Break. Get a new pair of shades at Sunglass Hut. Brands include Michael Kors, Tiffany & Co. and Ralph Lauren. Catch a movie at Paragon Theater. It’s a first-run movie theater with ten screens. Surprise the kids with a visit to Angell & Phelps Chocolate Factory. Try chocolate-covered Oreo’s, Gummy Bears and even bacon! Non-chocolate gourmet candy includes jelly beans, Swedish Fish and Salt Water Taffy. Daytona International Speedway is known as the “world center of racing” and has been the home of the Daytona 500 since 1959. Check out their new race track; it was completed in early 2016.